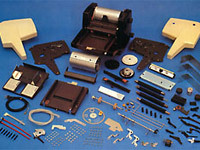 The 400 plus components in the assembly that is pictured to the right include pressure die castings, gravity castings, stampings, sintered powdered metal parts, rubber moldings, plastic injection moldings, cold headed and screw machined parts. With the growing sophistication of Pacific Rim manufacturers and their supplier base, The Simmons Group is bringing an increasing number of value-added engineering projects to our offices in Taiwan, Hong Kong and China. Based on mature designs or newly developed products, a growing number of our customers are taking advantage of the benefits offered by Pacific Rim engineering to manufacture complex finished assemblies. The growing sophistication of manufacturers in these two places to manage complex projects, coupled with the ability to out-source within local industry an increasing range of component parts, lend support to such programs. These programs are fully supported by our own on-site personnel. Our engineering and operations group assumes overall project responsibility, first identifying and then qualifying the prime manufacturer. They then work with the selected manufacturer in evaluating and addressing all engineering issues. They continue their involvement through the tooling, sampling and manufacturing phases. These personnel also work with the primary vendor to identify and qualify local suppliers of a full range of parts, from mechanical stampings and plastic injection components to electronic sub-assemblies. Our Quality Control Department's involvement begins at the earliest stages. It helps qualify the prime vendor for each project and continues to work with the vendor to ensure that the proper quality control and quality assurance controls are in place. To ensure the finished products meet our clients' specifications, our quality control personnel work with clients to define and implement our own in- process and audit inspection procedures.